You are currently browsing the Bringing Jerry Zimmer Home blog archives for November, 2012. Veterans have been among the most ardent supporters of our family’s efforts to bring home Jerry’s and Al’s remains from Vietnam. And over the years, there have been many veterans, especially Marines, who have been so kind to me, and this short blog is about one that became my inspiration for Veterans Day. I was deeply honored when the lapel pin, pictured above, arrived a couple of days ago, and even more so when I understood the circumstances. It was sent to me by retired Major Geoff “Jeep” Pomroy, USMC — a career Vietnam War veteran and helicopter pilot, who my husband, Ron, met through a mutual Marine friend. I have never met Geoff, but he has followed my blog, and I appreciate knowing that he’s out there. Ron had long admired a lapel pin, designed by Maj Pomroy and worn by Col “Pearl” Wederbrook, USMC, (Ret), a former CO of Marine Air Group 11 at MCAS Miramar in San Diego, CA. The original pin depicted the US and USMC crossed flags, topped with a small set of Naval Aviator wings. 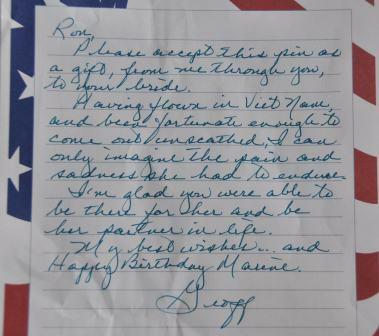 Through Pearl, Ron contacted Geoff and ordered the same pin, which arrived shortly thereafter. 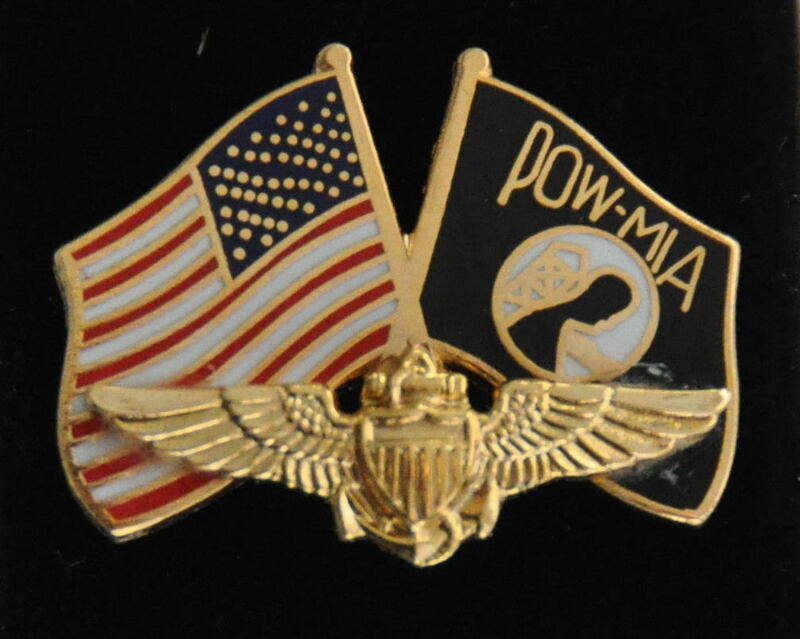 Ron was so impressed with the quality and simplicity of his new pin, that unbeknownst to me, he asked Geoff if it would be possible to create a similar pin, but with the US and POW/MIA flags set behind the Naval Aviator wings. Geof’s biggest challenge was finding the right size and style of flags to make an attractive, appropriate pin to fulfill Ron’s request. In the meantime, about a month went by, and Ron forgot that he had ordered the special-design pin, until it arrived — just before the 237th Marine Corps Birthday and Veterans Day 2012. Not only did the one-off pin arrive, but Geof also attached the very kind note posted below. This gift is very special to me and a meaningful tribute to all MIA aviators still unaccounted for. Although I don’t sell anything on this site, I am certain that some readers will want one of these lapel pins, which is roughly the size of a dime and very reasonably priced — it is not made of precious metal. Please contact Geoff at g_w_pegasus@yahoo.com. 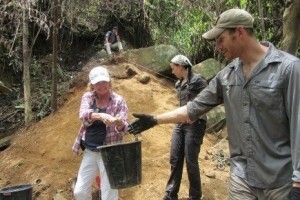 L-R: Elaine Zimmer Davis; Kristen Baker, anthropologist; Capt Christian Stone, USA, team leader. Elaine learned firsthand of the difficulty in finding loved one’s remains at crash sites like Jerry’s and Al’s, where the debris field of an F-4 Phantom is large and the remains are likely to be small, if found. The Presidential election is over, but hopefully not the work of searching for our MIAs from past wars. We will soon know how the budget shakes out for the DoD, from which the Joint POW/MIA Accounting Command (JPAC) indirectly receives its funding. As of October 2012, JPACs Central Identification Lab (CIL) and its predecessors have identified 991 MIAs from the Vietnam War, which is the only way an MIA can officially be listed as accounted-for and the case closed. This figure reveals a lot about the difficulty encountered over the past four decades to retrieve our MIAs from that part of the world, where post-war fallout created seemingly endless problems. 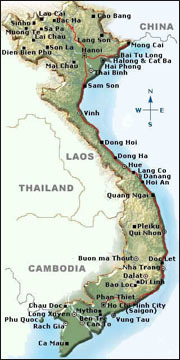 The good news is that current operations in Vietnam, Cambodia and to some extent in Laos have never been more amicable. The National POW/MIA League of Families, under long-time advocate and League Chairman for Vietnam War MIAs, Ann Mills Griffiths, continues to urge our government to press on, now that we are receiving good cooperation from our former adversaries. The leaders in the US accounting community seem to have received the message. Nevertheless, no one is underestimating the negative effects of budget cuts and the desire to increase WWII recoveries. And while no one fears that a departure from operations in Southeast Asia is imminent, families are always concerned about deep cuts. In the search for additional leverage, we may have stumbled across an unexpected gift that visionaries should recognize as a solid reason for the US to stay the course in Vietnam War locations, while conducting neighboring WWII recoveries — possibly in Myanmar/Burma, looking for hundreds of our pilots killed while crossing the Hump — still regarded as the most dangerous flying in wartime history. During my visit to Vietnam in May/June 2012, I spoke briefly with current JPAC Commander LTC Patrick Keene, a career Army officer who heads Detachment Two in Hanoi. “We can finish this job within the next seven or eight years,” he said, noting that some MIAs may never be recovered, but JPAC needs to keep digging for those with potential. My first husband, Capt Jerry Zimmer, USMC, and his Radar Intercept Officer (RIO), 1st Lt. Al Graf, are believed to fall in the latter category. As a Foreign Area Officer (FAO), LTC Keene’s background may be one of the primary reasons for his selection to lead JPACs top in-country billet at this point in history. An FAO is trained to work in foreign countries and to advise senior U.S. military and civilian leaders on regional issues. LTC Keene’s knowledge of Southeast Asia with a Vietnam specialty dates back to 2002 when he was assigned to the U.S. Embassy in Hanoi and later assumed responsibility for the U.S. Humanitarian Assistance/Demining Program. 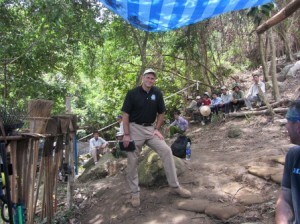 He sees the bigger picture in Vietnam and looks at ways in which JPAC can balance recovery efforts with an eye on helping the country achieve its future goals in other areas – no doubt LTC Keene’s vision is similar to those who believe that Vietnam can potentially become a major port of call and a lot more. LTC Patrick Keene, Commander of JPACs Detachment Two in Hanoi believes that the US can complete the job of recovering our MIAs from the Vietnam War in less than a decade, but Keene knows that it can’t be done without proper funding. But LTC Keene and other members of the active-duty military are not wearing blinders. They know that deep cuts in the DoD budget could hurt all operations, including MIA recoveries across the board. However, the realignment of troops to the Asia Pacific Theater, as they depart Iraq and Afghanistan, could benefit Vietnam War recoveries — even though the primary reason for the realignment is to maintain stability in Asia Pacific. With 60% of US naval assets moving in that direction, it is well known that several countries, some of which include US allies and trade partners, have been involved in long-time disputes with their neighbors, particularly over maritime issues in which China frequently is a common denominator. Although maritime issues may sound like a benign concern, there is a lot at stake for several countries vying for ownership of trade routes and natural resources in the South China Sea and elsewhere. The squabbles might end up erupting into something more, so our military’s presence can assist in achieving a peaceful, equitable outcome for all involved. Among areas of concern is Vietnam – a country in which we have invested dearly over the years to bring home our MIAs, mend fences and help the country prosper as trade partners, so it might be advisable that we stay the course, or someone else will take our place. According to Kathleen Hicks, principal undersecretary of defense for policy, in a speech on Sept 24, 2012, to the Center for Strategic and International Studies, “The stability and prosperity in this region [Asia Pacific Theater] will be shaped by our ability to work together.” Hicks also spoke about the “whole of government” effort to strengthen partnerships and deepen relationships with emerging powers for human rights and to advance trade and investment in the region. Budget shortfalls or not, there is no turning back now. The need to comply with the mandate in the 2010 National Defense Authorization Act (NDAA) for JPAC to produce 200 identifications annually by 2015 will probably favor recoveries with the greatest chance of success and the path of least resistance in countries where we have a lot more at stake than the return of our MIAs. Whatever it takes to keep JPAC on the job in Southeast Asia is okay with me and I am certain with other families who have loved ones still unaccounted-for in Southeast Asia.